Made with Certified Organic Neem. Neem is revered by Ayurvedic practitioners to support healthy looking skin. Used for centuries, neem soothes, nourishes and moisturizes even the most sensitive skin. 98% of the ingredients in this beneficial formula are comprised of the aqueous extract of Certified Organic Neem Leaf & Aloe Vera Gel. Greaseless and fast absorbing, it soothes hot skin, including insect bites, chafed, chapped, burned and irritated skin. Also excellent after sun to replace moisture and minimize peeling. I love it. I mix my own skin lotion which includes vitamin C, vitamin E and other natural ingredients and use this aloe mixture to bring it together. Thermaneen also makes this mixture easier to spread over my face and neck. Love it! Little different than expected but I like it. Amazing. 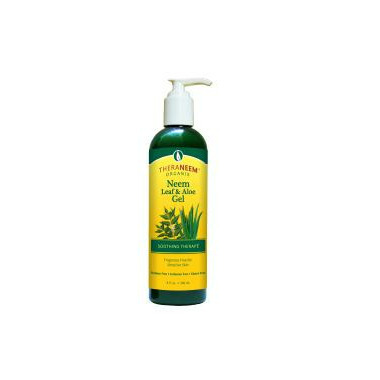 I use this product as a full body lotion (even gentle enough for my face!) it is fantastic. I use it everyday even if i haven't been in the sun and it leaves my skin so soft and glowy. It absorbs in seconds which i love, and does not leave a greasy feeling. It does not transfer to clothes and has a nice lavender smell. Definitely would recommend this to anyone. I use this in conjunction with the lotion and have excellent results with itchy skin. I can't imagine being without either of them!!! I have been using this gel (along with TheraNeem Leaf & Oil Lotion on top) for a terribly itchy rash on my legs. WOW what amazing results!!! I hope Well never stops carrying these 2 products because they works so well together and I finally have relief - after trying so many other things, including a prescription lotion from my doctor with no results.